It’s not the work it takes to prepare cou cou and flying fish that keeps Jackie Jordan, a Barbadian immigrant in Dorchester, from preparing the traditional dish of her homeland more than several times a year. Rather, it’s that flying fish are a rarity in Boston. “Back home, we’d do it every Saturday,’’ she says. 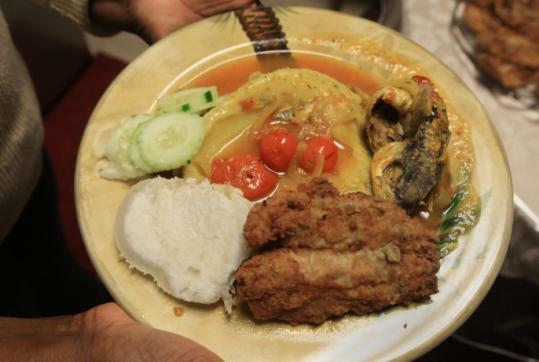 Cou cou and flying fish are a staple on the island, a nation that has long dubbed itself “The Land of Flying Fish’’ (cou cou, cornmeal and okra, is the classic accompaniment to the fish). The cou cou is topped by a spicy stock made from flying fish heads, okra, ketchup, olive oil, and various herbs and spices. The flying fish fillets are battered, breaded, and fried, providing a crisp and delicate complement to the thick cornmeal and spicy stock. Flying fish appear on Barbadian coins, the seal of the Barbados Tourism Authority, and in island art. The fish seldom grow longer than 12 inches and can be found in groceries and restaurants in cities like Miami, or even as far north as New York. Boston’s Barbadians, or Bajans, have had to resort to bringing back the fish from home. Trip veterans say that frozen, well-packaged fish easily survive the roughly eight-hour flight (layover included) to Boston. The effort may seem over-the-top, but for Bajan immigrants who want to pass on culinary traditions and long for the unique blend of flavors, it’s no trouble. It’s also legal to bring into the country, according to the US Fish and Wildlife Service. Flying fish and just about any other kind of fish for consumption - except cuttlefish, jellyfish, octopus, and squid - are all OK.
Jordan brought flying fish from home in August. On a recent Saturday afternoon, she was preparing a Bajan feast for friends and family gathered at the home of her niece, Lisa Lowe, in Mattapan. While Jordan does most of the cooking, her sisters Ingrid Harewood and Carol-Anne Odlum hover nearby, along with Lowe, ready to assist. Lowe had already seasoned the fillets and heads with chopped onion, scallions, thyme, black and red pepper, ground cloves, and salt. Jordan begins by boiling batatas, whitish sweet potatoes, which will be a side dish. Then she moves on to the stock, and starts by sauteing the fish heads in olive oil. She adds sprigs of thyme, onions, okra, and a dozen plum tomatoes. In another bowl, she mixes a paste of ketchup, olive oil, cayenne and black peppers, and curry powder. The intense reddish-orange mixture goes into the fish heads and after 20 minutes, becomes a colorful, aromatic stock. To prepare the fillets for frying, Odlum dips the fish in an egg mixture, coats them in breading, then fries them until they’re crispy and golden. Meanwhile, the okra is cooking in water whose broth is stirred periodically into a pot of cornmeal. Because relatively little broth is used, the cornmeal is dense and difficult to stir. The women take turns. In Barbados, most families have a cou cou stick, shaped like a cricket bat, with a flat, rectangular paddle for this. Jordan makes do with a wooden spatula. Okra broth gives the cornmeal a gelatinous texture. Jordan puts it in a bowl, shapes it into a mound, and places it in the center of the plate. All the fish has been fried and the batatas peeled. Both are set next to the cornmeal. The stock, fish-heads included, is poured over the cornmeal. There is also sliced cucumber with lime juice, a common side dish to cool the palate. A refreshing drink of mauby syrup - derived from the bark of the mauby tree - and water complete the meal; the flavor is sweet, reminiscent of root beer, with a slightly bitter aftertaste. Variations of the flying fish dish exist on Antigua, the Virgin Islands, and other Caribbean islands, but are made without the okra, and are known as fengi or fungi. Found in every warm-water ocean, flying fish are also a staple on China’s Orchid Island, and are frequently used in Japanese sushi. According to Barbados’s government, flying fish account for 60 percent of the weight of all fish landed on the island. Overfishing, however, has reportedly decreased their numbers, and set off maritime boundary disputes among Caribbean nations. In 2006, member nations of the United Nations Convention on the Law of the Sea settled one such dispute between Barbados and Trinidad and Tobago, ordering the two countries to take measures to better steward flying fish populations. Here, Tropical Foods in Dudley Square sells headless flying fish in 200-gram packages - five or six fillets - for $7. The shop also carries various types of cornmeal, okra, and other ingredients for the dish, including four brands of mauby syrup. Tropical Foods owner-manager Ronn Garry started getting flying fish five or six years ago after frequent requests. He met a Barbadian immigrant who knew flying fish wholesalers in New York. Garry won’t reveal his supplier’s name. “It’s a trade secret we hold very closely,’’ says the entrepreneur.